If you love string machines, you should totally check this post, because it is about a truly amazing string machine, the Crumar MultiMan S! And when you start thinking about Crumar String Machines, probably the one machine you'll think about is their 1979 classic Crumar Performer, which was used by Nick Rhodes, the keyboard player of legendary band Duran Duran, rather than on the Crumar MultiMan S (also known as Orchestrator). Before going into much detail on why I sold it, I can tell you right away that the sound was the last reason why I would ever consider selling this amazing String Machine! I have to say that my experience with String Machines is quite limited, as I wasn't around in the 70s when they were really popular, but in my small studio I have the pleasure of having a Korg Trident and a semi-functional Eminent 310u (it works well enough to understand how it sounds, but needs some repairs to be actually used in my music...). 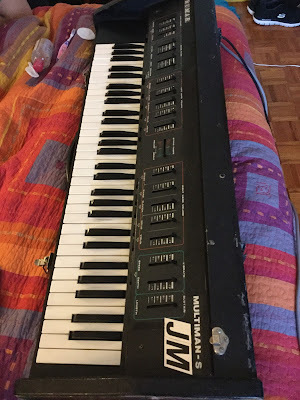 While the Korg Trident is still an a bit of an unknown jewel in the synth world (but those who know it well know it is a truly amazing synth with a nice string machine section! ), the Eminent 310u is a true classic used by Jean-Michel Jarre in so many tracks (together with the EHX Small Stone Phaser it provided his classic string sound). It definitely sounds different and I would say the Crumar is more of a melodic machine, with an amazing sound to play some nice melodies, while the Korg Trident is more of a machine I'd use for fat string pad sounds, more symphonic (I won't say anything about the character of the Eminent 310u as I have barely used mine, but could understand it sounds amazing!). But the sound quality of these machines is, to me, in the same league. In my last play with it (when I was demonstrating it to its new owner before finalising the deal), I used the Roland SPH-323 and Lexicon PCM60 and it sounded truly amazing as well (it really made sad to give up on it...)! In terms of features, this is also a pretty interesting machine! It might be a bit more limited than the Crumar Performer when it comes to tweaking the different sounds, but I honestly feel it is actually more of a performer's machine. For starters, it features piano sounds (piano and clavichord), which are not available in the Crumar Performer. If you are expecting realistic piano sounds, you will be quite disappointed, but if you are looking for nice percussive sounds to layer with your string and brass sounds, I'm sure you will appreciate this addition! The other big plus is that the keyboard is actually split in two and you can select the volumes for the different sounds in those two regions. It won't be the same has having two different machines, since the parameters you have to shape your sound will affect both regions, but it can be quite useful sometimes! So, why did I sell it? Another reason was the fact that I still have that Crumar Performer, which is considerably more compact and light. Would I get another one? If you like String Machines and you can get one of these, be sure to do so! To me, these are amazing machines, with a truly amazing sound, especially when you add some effects to the sound!